This circuit will allow one to produce extremely fast gate rates for R/B devices. It may also work with EMEM type of devices. It will not work with hand held electrode devices. You will need two separate frequency generators to operate this device. One to set the gate rate, and the other to set the MOR. It is hoped that a small , inexpensive, frequency generator can be found that can be used to set the rate. This web page will be updated to reflect the utilization of such a frequency generator as soon as one is available. Some experimentation seems to indicate that best results are obtained in using a gate rate of between 58 and 72 Hz. 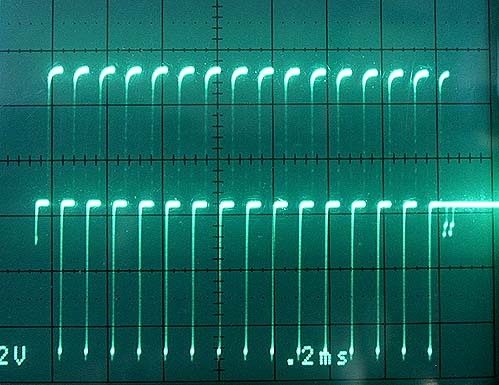 A peak seems to be reached at about 65-66 hz.Until recently, the use of 1 to 6 hz have been used as gate rates. These do not produce the dramatic entrainment effect found at much faster gate rates, especially in the 58 to 72 Hz region. One must match the gate rate to the MOR frequency! Try Using 16 Hz from about 500 to 1000 Hz, 20 - 30 Hz from 1000 to 1500 Hz and 60 +Hz from 1500 Hz up. As more is learned about these fast gate rates , this page will be updated , and will reflect what has become the generally accepted gate rates for a particular range of MOR.  the tendency for two oscillating bodies to lock into phase so that they vibrate in harmony. It is also defined as a synchronization of two or more rhythmic cycles. The principle of entrainment is universal, appearing in chemistry, pharmacology, biology, medicine, psychology, sociology, astronomy, architecture and more. In other words - if one targets an area of the body, or infectious organism with a frequency that they are resonant to, lacking entrainment, that frequency may be ineffective. The reason is this. ; the area of the body or infectious organism has a different beat than that of the (frequency ) being generated. The two are not dancing ( to use an analogy) in beat to the same frequency! If the external frequencies entrainment rate lacks adequate intensity, or adequate rate, there will be no entrainment by the body or organism to that external frequency ! An analogy to this would be performing a popular dance song at too slow a beat. The song and instruments would be in tune, but the beat would be too slow to make anyone want to dance. Same would occur if the music was played at the correct tempo, but was played so softly no one could hear or "feel" the beat. The SCR should have a low gate voltage. Most SCRs have under a 3 volt gate. That is they need three volts to operate the gate. I am presently using an NTE 5437 SCR but something similar will work fine. The two diodes in the circuit are nothing fancy, but Id recommend they be rated at least 50 PIV @ 1 amp. All the parts save the SCR are available from Radio Shack. Radio Shack does have an SCR available on special order. There is about a 1.5 volt drop across each diode. So when you first operate the device, you will have to increase the output voltage of the MOR frequency generator to compensate. To get to operate, turn up the voltage on the gate circuit with a frequency of about 2 Hz, this will let you see if the gate is working. As the gate frequency is increased, you may have to increase the voltage of the gate. Increase the voltage from the MOR generator until maximum power shows on the antenna tuner dial. The gate will not work unless the voltages from the MOR and Gate frequency generators are high enough! Too much voltage from the MOR generator can over drive your CB, so use only enough voltage to produce maximum power on the antenna tuner fwd power meter. Expect to see power drop off about 1/3rd at a very fast pulse rate. If you device makes 150 watts continuous power output, it will make about 100 watts on the meter when gated at 60 Hz. By varying the duty cycle of the gate frequency, one may directly influence the duration of time between each gate. I like to set my gate to about a 75% duty cycle, and this seems to produce a superior effect to that of a 50% duty cycle. THE EFFECTS OF ENTRAINMENT CAN BE VERY INTENSE! CONSTRUCT AND USE THIS DEVICE AT YOUR OWN DISCRETION AND RISK! Notice the orientation of the banded end of the diodes. These must be installed correctly! Assembly Is Simple, And Should Take Less Than One Hour. 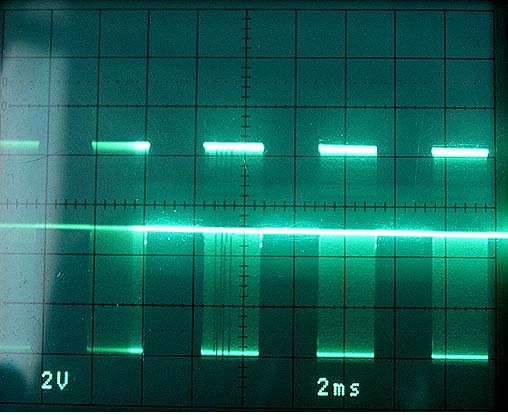 A single pulse of square waves generated by the device.